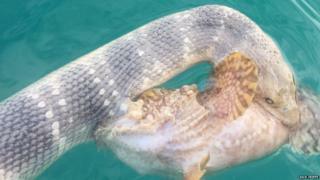 An Australian spear fisherman has captured a bizarre battle between what appears to be one of the world's most venomous fish and a deadly snake. Rick Trippe spotted the elegant sea snake latching onto an apparent stonefish off Darwin last Thursday. His photos of the showdown quickly went viral. Speaking to the BBC, Mr Trippe said he had been diving on a World War Two wreck in Darwin Harbour when he made the unusual find. Mr Trippe said he drew on his experience of fishing pythons out of his chicken coop when he pulled the wrestling creatures from the water, clutching the snake under its mouth. "I'm silly but not mad. I knew this was dangerous. I knew if I grabbed it I wouldn't get the bitten," Mr Trippe said. Image caption "I asked my mate to take a couple of photos - he wasn't too keen but he took them," Mr Trippe told the BBC. "I could hear the fish croaking so I let them both go, but the snake made a beeline back to the fish," he said. The highly venomous snake eventually came out on top, but it could possibly have died as well from the poisonous stonefish. The venom released from the 13 spines on a stonefish's back can kill a human in two hours if not treated. Mr Trippe has encountered some strange scenes in Darwin Harbour before. Two weeks ago, he was part of a team who helped rescue a horse that ended up stranded in the harbour.